Pacing and nutrition are the two critical elements of an Ironman race plan. The energy requirements of race day demand a regular intake of calories. The harder you race the more critical fuelling becomes – intensity determines the rate calories are burned and the composition of fuel used. Successful Ironman racing involves balancing intensity and nutrition to maintain effort to the finish. The objective is simple – eat as much as you can whilst going as fast as you can. An Ironman will require at least 8000 calories. The body stores up to 2000 calories in readily available glycogen and significantly more in fat. Rested and well fed during taper week will ensure those glycogen reserves are full; roughly a quarter of our calorific needs for race day. The rate of energy expenditure is determined by how hard we work – the higher the absolute level, the more calories used. A 200W effort places similar energy demands on the body whether you’re a 90kg man or a 55kg woman. Efficiency will have an on the calories being burned in that example, but body composition makes minimal differences. As a rule larger athletes will have higher calorific needs during a race by virtue of working at higher absolute intensities. It’s likely the relative intensity of the 200W effort was different for the two athletes – a 60% effort for the man versus a 90% effort for the woman. In terms of energetics the same, but the resulting pace and rate of fatigue are significantly different. Fuel sources should also be considered. Carbohydrate and fat are used at differing rates according to intensity; harder efforts utilise increasing amount of carbohydrate. Depending on metabolic efficiency Ironman efforts will burn more fat, consequently sparing more glycogen. It doesn’t change the nutrition plan, but it provides a buffer and can influence pacing choices. The goal is to consume as many calories as we can tolerate at race pace. The precise source isn’t important as long as it is primarily carbohydrate and we know we can comfortably digest it. Testing nutrition choices in training and tune-up races is essential – we have to know we can stomach them. The gut can absorb 60 to 90g of carbohydrate per hour depending on the mix used (60g glucose/maltodextrin, 30g fructose); roughly 250 to 400 calories of food. Anything beyond that will remain in the digestive system until it is absorbed; not an issue relaxing after a big meal, but potentially a problem when racing. Exact absorption rates will vary and our strategy should aim towards the highest level that works. Training volume is reduced during the taper so daily calorie requirements will fall. There is no need to excessively eat, the diet that supported training will be more than you need. Regardless of duration workouts should be well fuelled, this combined with a normal diet this will replenish glycogen stores. The day before the Ironman is traditionally a period of carbo loading, but you still don’t need to excessively consume. Eat meals earlier in the day, keep food choices simple and place an emphasis on carbohydrate. Stay in control – don’t let anxiety determine your diet. Eat breakfast around three hours before the start to allow the food to digest. Overnight fasting will have depleted the liver’s glycogen stores, it doesn’t take a huge meal to replenish. Still aim for a high calorie intake to set yourself up for the demands of the day. Food choices should involve carbohydrates and should be tested during training to be certain they work. My preference: a bagel with cheese, jam and some roast chicken; an energy bar; and lots of strong coffee. During the hour before the swim consume energy drink or a gel to top levels up. At least the first hour of racing will be without food so a head start is useful. There is no opportunity to eat. If you are a back of pack swimmer and expect to be a long time in the water you could place a gel in your wetsuit sleeve to consume halfway round. For most it’s a case of head down and swim. Whilst transitions give a good opportunity to eat, it’s not something I recommend. Keep moving and take your food on the bike and the run to save yourself time. Minutes lost here count. The longest part of the day and best opportunity to take on nutrition. At Ironman pace it shouldn’t be difficult to consume food so target as many calories per hour as your stomach tolerates. Start eating as early as possible and continue through to the marathon; taper the quantity and avoid solids in the last hour to clear the stomach before the run. Set an eating schedule – every 15 minutes consume something delivering between 70 to 100 calories. Evenly distributing your calorie intake will help ensure a consistent performance and avoid the risk of dips in energy. Eat even when you don’t feel like it. Wash all food down with water to help it pass through the stomach and aid absorption. My preference: 3 energy bars (600 cals) and a bottle containing 15 to 18 gels (1500 – 1800 cals). Water is taken from aid stations on the course. Even at Ironman pace it is harder to eat whilst running. A successful nutrition strategy should ensure you reach the marathon with glycogen reserves remaining. Maintaining performance will require you to continue eating throughout the run. The aim remains to consume as much as you can, finding the balance between race pace and fuelling. Intake will be lower than on the bike and I recommend avoiding solid food. A schedule is still important, eat every 20 to 30 minutes. At a consistent pace aid stations are normally frequent enough to act as timers; a strategy tied to taking in energy at each station can be very effective and simple to follow. Again identify in training foods that work and avoid anything that doesn’t sit well. Gels, energy drinks and coke are obvious choices and easily available. Once you’re within thirty minutes of the finish stop eating. Anything you consume at this point will take too long to absorb to be of use. Focus on raising your effort and pushing hard for the line. At most take fluids on from aid stations. 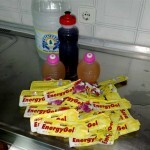 My preference: a gel (100 cals) every thirty minutes, energy drink at aid stations. I alternate aid station having a gel at one and energy drink at the next. Eat well in race week – start the race with body at glycogen capacity. A fuelling strategy will help spare muscle glycogen for the marathon. Balance pacing with eating to ensure you have energy through to the finish. Schedule eating as part of the plan – keep your intake of fuel consistent. Practice race fuelling in some workouts – get the body used to eating whilst active. Learn to eat more. Practice with different energy sources, find ones that work best for you. Test it in a tune-up race to ensure they work under stress.